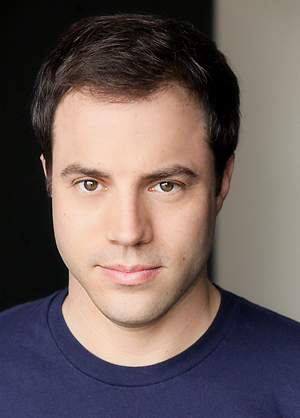 Meet Geoff Johns, Warner Bros.’ new Chief Creative Officer and the go-to geek for DC Comics’ ever-expanding universe. With Ryan Reynolds’ emerald abs casting a glow over theater audiences everwhere this weekend, Warner Bros. will unveil its first big superhero franchise since Superman and Batman. Behind much of the story is their geek secret weapon, Geoff Johns. Anointed Chief Creative Officer in February, 2010, and a coproducer of the film, the 38-year-old self-described “Green Lantern guru” is a fanboy-approved comic book, TV, animation, and video game, writer. He even co-owns a comic book store near his L.A. home. It’s his job to modernize DC comic characters and ensure they remain true to the DC Universe mythology, a key part of the studio’s ambitious new plan to mine its DC comics library and transform it into more Marvel-ous revenue. With a string of movies, live-action and animated TV shows, and a stage production in the works, not to mention revamping Justice League and Aquaman for the recently announced DC Comics reboot, Johns is pretty much living and breathing comics round the clock. He talked to Fast Company about keeping the superheroes real. FAST COMPANY: What were your co-producing duties on Green Lantern? How closely does Green Lantern borrow from your revitalized story lines compared to older issues? It borrows a lot from the recent changes that were made to the mythology, Green Lantern: Secret Origin, which is a book I wrote a few years ago  that retells the origin of Hal Jordan. But the film also takes things from all decades of Green Lantern stories. Is there a Green Lantern trilogy planned? There are definitely plans for more Green Lantern films. I would hope it’s more than a trilogy. I think Green Lantern has a lot of movies in it, a lot of stories to tell. The Flash, which I wrote the treatment for, is also in development, but I can’t say much more than that. Other than Green Lantern, what are your duties as Chief Creative Officer? You know, I just never get used to the title! As CCO, I oversee the creative development of film, television, animation, interactive, and licensing with the other Warner Bros. divisions. My team and I go through the libraries of DC and Vertigo, which is the more mature brand, sort of like the HBO of comics. We pick out things we think could be live-action shows, films, animated series, or direct-to-video. Then we brainstorm with various Warner Bros. and Franchise Management divisions. That’s essentially what we do all day. You’ve had your hand in a diverse array of upcoming projects: this year’s Batman Live: World Arena Tour, next year’s Cartoon Network DC Nation programming block, and a 2013 (according to IMDB) film of The Flash. What qualities are you looking for in the selection process? There’s no one comic book where you say,”This is a perfect adaptation for a TV show.” It doesn’t exist. Sometimes, comics can get very continuity heavy. So whenever I approach a book, I go to the heart of the character and find that core concept that’s really relatable. We pull out a story and say, “This is a great story, or this is a great character who can stand on his or her own, or this is perfect for television.” But just because a character has story potential, doesn’t mean we think it’ll work in every medium. Do you only focus on stories and characters you’ve revitalized, or also consider older story lines for other media? There are stories throughout the decades that work really well. There are also really great characters. For instance, there’s a character called Hourman. He’s been around for 60 years, but has never had his own series. So we develop him in house a little bit more, and then we talk to the people at Warner Television about what their take could be. Raven, who is part of the Teen Titans, is another character we’ve explored. Raven’s very well-known and loved, but she’s always been part of a team. You’ve seen Rosemary’s Baby? Picture that kid grown up. So it’s a really interesting mythology to delve into. Vertigo has a comic, 100 Bullets, which is a great story if you like crime comics, and it’s going to be a great TV show. Vertigo comics tend to create their own worlds, so we can see clearly what each story line is, and consider them for television or film. Last month, DC Comics announced its plan to launch 52 revamped and renumbered issue lines, with same-day digital releases, this September. Although you weren’t involved in that strategy, you’ll be reworking Justice League–with artist and co-publisher Jim Lee–and Aquaman. Will there be a push to use the new stories coming out in the fall revamp for other media? The new stories won’t take precedence over the older ones, because they’re different entities. 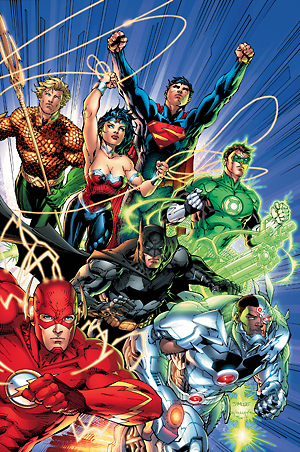 Publishing is run by Dan DiDio and Jim Lee, the co-publishers, and Bob Harras, the editor-in-chief, and they’ve laid out a publishing plan for September. The editors and creators are doing a whole lot of new takes on characters. So what kind of themes are you trying to bring your revamped version of Justice League? The one thing I’m trying to do with Justice League is to really make it accessible, so that anybody can pick up that first issue and understand it. Anybody. These characters are icons, and so the public sees them a certain way, but behind the masks, they are people. They make mistakes, they have egos. Batman and Green Lantern are the focus of the first issue, and they’re exact opposite characters. Batman hides in the shadows, uses fear as a weapon, and is really grounded, while Green Lantern is this big, glowing green guy who can overcome fear and doesn’t hide himself. They shouldn’t work together. That’s the point of the book. [Johns reveals a page of Lee’s beautifully rendered pencil layouts of a glowing Green Lantern descending upon an annoyed Batman looking up from the pavement.] This is the first time they ever meet. The public might see them as symbols, but behind the icons are people with problems, viewpoints, and good and bad traits. That’s what I want to explore. There’s also more humor in it than we’ve previously had. What do you regard as the DC Comics style? These stories have a great message of hope and inspiration. There’s absolute darkness in the universe. There are villains who do horrible things that you want to contrast with the bright hope, excitement, and adventure of the heroes. But at the core, it’s a place where the heroes are embraced. How did you come to co-own a comic book store? The store where I’d buy comics–Earth 2 in Sherman Oaks–is owned by Carr De’Angelo and Judd Myers, really smart guys who won an Eisner Award for retailing. They were talking about opening up a second store in Northridge. My goals for partnering with Carr and Judd were educational. Getting into retailing has given me a whole new perspective on the business. Now I can go to that store, look at what people are enjoying, what their buying habits are, what experience that they want. Comic shops can be really good places for people to meet, hang out, and make new friends–in person, which is nice.